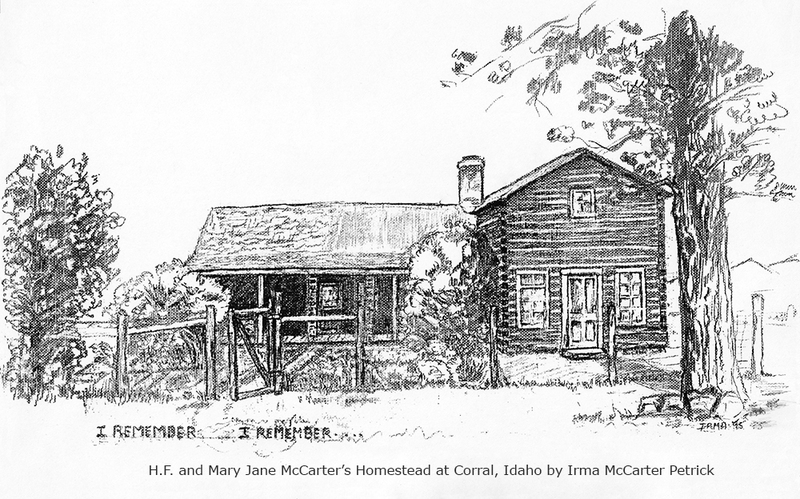 In 1995 Irma McCarter Petrick drew the old McCarter homestead on Corral Creek from memory. It was the original home of her grandparents H.F. and Mary (Senter) McCarter and their children Lalla, Orla, Sally, Will, Card, Claude, Kate, and Earl when they homesteaded in Idaho in the 1880s. Her father, Will, was the first child born in the house in 1887. Will and Mattie (Thorpe) McCarter took over the ranch in about 1923, and Irma and her siblings, Agnes, Marjorie, Wilma, Eileen, and Joe were also raised there as were, for a time, granddaughters Naoma and Jackie. In 1942 Will and Mattie decided it was time to upgrade and had the old home demolished and replaced with a new three bedroom home with running water and electricity. Irma and her siblings are gone now, but we have her memories of the old home in this letter she sent to her niece. The print is poor, but looked better after it was matted and framed. Gave one print to everyone who had lived in the house last year at Christmas and had one made for you as I knew you had Grandpa and Grandma's pictures and it was their original house, of course. Really don't know how they all managed with only two bedrooms, but of course they weren't all home at the same time. There weren't any closets either except downstairs in the living room underneath the stairs. The way I remember it, Mom kept the winter's sugar and flour in big sacks in there. We did hang our nightgowns in there as we dressed downstairs. Mom also had her piece bag (pieces left after she cut out the dresses she was always making) in there. We raided it constantly to make our doll clothes. Upstairs there was a shelf in each room on the wall about as high as one's head with curtains around it to hang clothes under. The cellar and the "milk house" were on the end of the long part with the big kitchen between it and the living room which was in the log section. The table you have was made full size and, with all the big family plus a varying number of hired hands or whoever, it took up a lot of the kitchen. We had a pump in the kitchen and, of course, the big home comfort cook stove. It had a water reservoir on one side that heated all the water for baths and hair washing, etc. Dad hauled hot water from the Hot Springs for washing clothes. What a luxury that was! Saturday night was a real test for the old stove and all of us for we had to bathe in the kitchen always with the fear of someone coming, and they often did. After Marjorie and Agnes were married and gone, we three younger ones (Irma, Wilma, and Eileen) slept in the bedroom directly over the living room. I slept in a cot under the west window and in the spring and summer with the window wide open I could smell the crab apple blooms or hay drying or just the barn yard. It all seemed so right! Mom always had sweet peas on the fence in front of the house and, as you might be able to see, she had a flower garden in rows on the left as you go through the gate. She had so many different things - canterbury bells, oriental poppies, many kinds of daisies, and bulbs. Every morning after breakfast, she and we girls went to see the flowers. She loved all of them, and working in them, after her hard days, was her biggest pleasure. The picture of the old house brings so many wonderful memories to me, and I think it did to all the family. In fact my sister Agnes said she cried when she saw it. So I felt really well rewarded for my effort. While you didn't live in it, I'm sure your childhood memories of the home place were much the same as mine. Hope you will like the picture.